I was trying to print this [www.thingiverse.com] today. After about 14 minutes of the estimated 44, the printer just stopped in mid movement and would not continue. The only way I was able to get control back was to turn it off and exit Repetier host (both of these - kill print, emergency stop, and just turning it off alone didn't do it). Any ideas what could have happened? I've done prints that take longer than this before without problems. Maybe an issue with the model file? Or is it more likely to indicate a problem with the printer itself? I have 3 endstops connected to MIN but only x_min triggers as it should. When I manually close it - M119 returns "x_min: TRIGGERED", otherwise - "x_min: open". What for y_min and z_min they always report "open" no matter if they are triggered physically or not. When I move an axis via Repetier Manual mode then triggering x_min does stop X axis move, triggering of y_min/z_min is just ignored (tried both directions). So M119 is consistent with "real action" and it's not just M119 issue. I have checked the endstops themselves and they seem to work similarly fine. Each of them does light up when triggered and multimeter shows same results for their contacts pairs when open/triggered. I also tried swapping endstops and result is always the same: the endstop connected to x_min reports its state correctly, the rest always report "open". Next I tried to plug endstops as MAX and found the following: x_max and z_max report their state correctly, y_max always reports "TRIGGERED". I thought it may be a pins soldering defect (I saw a post where someone was blaming Folger for bad RAMPS soldering). Detached RAMPS and checked it visually - it seems ok. So to sum up: the endstops plugged to certain positions don't report their state correctly. I run out of ideas and Google knows nothing. If someone has a thought or two of what it can be and how to fix that - please help. Edited 2 time(s). Last edit at 06/19/2015 10:40PM by IvanE. What bed temperature did you use for the 0.1mm? I got a nice print at 185C/70C/0.2mm, but at 185C/70C/0.1mm, the print didn't stick to the bed. On the issue of it locking up and needing to quit Repetier, as I said in another post I did get the same thing on a different run. I was using 210C/70C then went to 195C/70C for all layer thicknesses, including 0.1mm and 0.05mm, with no sticking issues. I printed and installed this fan shroud, and since then, I started having sticking issues. I guess the plastic was cooling too fast before it got to the glass! I did fix it manually though... At the start of the print, I change the speed to 50% until the 1st layer is done, then I put it back to 100%. I have also been playing with print speeds. I start at 50% 195C (bed always at 70C), then after the 1st layer, increase speed back to 100% and hot end to 210C. When it gets to 210C, I bump up the speed to 140%. I've printed 3 prints like that so far with almost no problems... the last 2 locked up on me though. One at layer 23/27 and the other at 9/27. After the 1st lock up, I quickly turned everything off and moved the head to kinda salvage the print. I closed Repitier and opened it and turned everything back on. I started the print again within 2 minutes of the 1st lockup. 9 layers later, it locked up again. So it almost seems to be overheating related, but I'm still not sure. I'm tempted to put a fan blowing between the Arduino and the RAMPS board. I can't feel the Arduino to see if it is getting hot, but I know there is no airflow between the boards. Ordered my E3D V6 hot end last night. Not to decide what style of extruder do I want to build it into. Bowden/Wades? I kind of like the Airtripper drives as they are direct drive so they are compatible with most of the parts in my MK7 extruder. I'm open to options and opinions. Curious why you didn't go with the lite version? I was looking at doing the lite version with this mount ( [www.thingiverse.com] ). I do not plan to print anything other than ABS so I don't need the extra heat. My biggest concern with the full E3D V6 is dealing with the extruder as mine is working well and I tend to screw things up when I try to fix them. Here is a G code change that may be helpful. I was finding that my printer would miss out the very last part of the top layer, as in this [goo.gl]. The print head moves away, and does the last few motions in the air. An old thread here (http://forums.reprap.org/read.php?151,222772,224437) has the answer: issue a M400 command in the end G code to flush the commands. I also found that my printer would stop with a grinding noise, and I think this may be a similar thing - the final homing was interrupted by the command to turn the motors off. I home Y as well as X because the position of the clips that hole the glass bed down mean that the head might collide with them on a low print near the center in the Y direction. I would like to do nylon and some of the more extreme types of material at some point. I had a heck of a time getting the bed up to 100 degrees (let alone the 110 I was shooting for). Somewhere I read that I should measure the voltage to the bed and it should be at least 12v. Mine was a little low. They said that can be adjusted, but where? I see folks changing the voltages to the steppers but I don't see where to do that either. I don't know about the voltage to the bed because I think that come straight from the power supply. For the steppers, you can adjust the voltages by turning the tiny potentiometers on the left of the PCBs. Use the non-conductive tool they supply. The manual for the older Folger model shows how to measure the Vrefs, but do it really carefully - something I did when I was trying this blew up my Arduino. On a different topic: the construction guide says the belts should be "tight but not too tight". So how tight is that? I just added the tension springs after watching some videos where people show them going "boing" if you pluck them. Mine weren't slack, but they were less tight than that. I can't tell if it's made a difference. That's interesting - I was looking for something to print to tension up the Y-axis belt. Mine is definitely looser than I'd like - I can move the bed back and forth without moving the motor. I don't see any impact on the print, so maybe I shouldn't worry? How did you add tension springs? Edit: Heh. Thanks YouTube. THAT'S what those things are for. Edited 1 time(s). Last edit at 06/20/2015 07:41PM by markts. I hooked them over the top part of the belt near to the X carriage and under the bed, with a bit of difficulty in the latter case. You have to be careful where you put them so they don't get in the way of the travel. Here's the X one: [goo.gl]. My kit included two of these springs, but if they are missing I've heard you can fashion your own from the spring in a clothes peg. Cool thanks! That's the video I saw (with the clothespin) and I remembered the springs were in the kit! I just finished installing it on the Y axis. Piece of cake! I just wonder it it's too taut now? I'll have to give it another print and find out. Thanks for the pic! Edited 1 time(s). Last edit at 06/20/2015 09:58PM by markts. How long does it take you guys to heat your glass bed? Mine take >25minutes from 20c to 100c. I've not taken mine that high yet, mine stays in the 60-70C range. I'd say 15 minutes or so to heat up, never really kept track. Printed this today to help tension the belt. Lost approx. 10mm in the X travel, though I think if I slide the bed and hardware over I can gain it back. I like the design with one exception, I think it needs a clip that would mount to one of the smooth rods for support or both rods, or redesign it to integrate into the Z-axis carrier. Well I've just spent several hours tracking down what turned out to be a really simple issue. 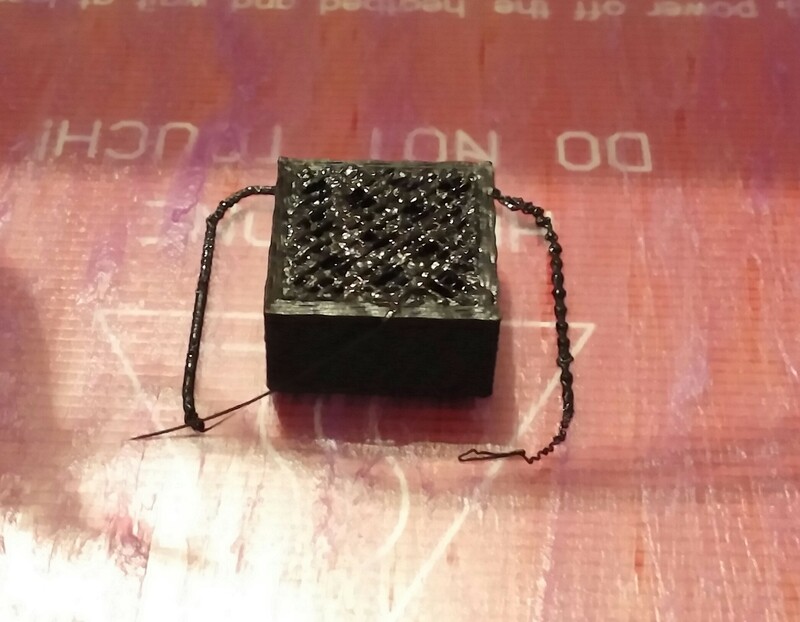 My prints were not adhering any more, so that soon after the print started the filament pulled off the bed and ended up in a sticky mess on the nozzle. I tried tons of things: higher first layer temperature, different bed temperatures, and more. The answer: the blue painters tape was worn out. Printing on an unused part of the tape worked. But this does also lead me to one question: is it normal to have a bit of extrusion from the nozzle before the print starts, or when I turn on the extruder heater manually but without running the extruder? Mine leaks a little before and after a print, I'm trying to work through a calibration procedure to minimize it. I just have to make sure I grab it before the printer takes off to start printing. I print 3 wraps around whatever I'm printing to make sure the nozzle is flowing nicely, with the occasional skirt on the part to help out as well. Devil, try this x tensioner, I didn't lose any room on the x axis on my acrylic Folgertech with it. I only used the part the bearings go in to, the other half is specific to the rework idler end. The one you already printed for the outside of the idler should work fine. Edited 2 time(s). Last edit at 06/20/2015 11:29PM by hockey9999. That would work, I think. I could probably pull the tensioner back a few mm, but I'm fine with were it's at for now. I haven't needed to print anything large enough to take up the whole build area. Edited 1 time(s). Last edit at 06/20/2015 11:35PM by Devil Inc. I didn't use the "belt stand", didn't look like it would work with our x end. I printed "belt x" and found a piece similar to yours for the other side. It is working great. Ouch, mine takes about 10 minutes max to get to 100c. Are you sure you wired yours right? Ouch, mine takes about 10 minutes max to get to 100c. Are you sure you wired yoursk right? Details? Do you insulate the bed? Plain glass or something else? In an enclosure? I just laid a piece of cardboard on it while heating and it helped immensely. Didn't do anything special. Just followed the guide. Not insulated on the bottom, not in an enclosure. The only thing going on is there's glass on the top. I was slightly wrong though, it took about 11 minutes today. When I'm in a hurry I feel that if I set it to 105, it'll get to 100 faster. Otherwise it's very incremental changes right at the edge. It's wired fine, and I've measured 12.05v during heating. For now I've got a piece if cardboard resting ontop of the bulldog clips to reflect some of the heat back. What a great looking kit! I just finished my acrylic,wish I saw this one! looks like a larger print area? It's the "official" one for this kit from my understanding. After witnessing some "play" in the Y belt, I installed a spring tensioner. It seems much better, so I started a 2 hour print. About 20 minutes in I heard a strange sound and found the bed had shifted. I thought the belt slipped because it started printing basically off the bed (on the side away from the endstop). Something must have bound up, so I tried removing the tensioner, but now the belt is stretched so that's not an option. I'll have to do a smaller print to see what's going on. I'm hoping it's something simple. I'm having the same trouble with mine now that I've added the adjustable tensioner to the X-Axis. Not sure if it's a 'that's too tight' condition or what. I'm going to work on troubleshooting it tonight, ran out of time to mess with it last night. I have to get it working smoothly, my E3D V6 hot end should be waiting for me when I get home from work. Still need to get an extruder mount, etc. printed for it. Edited 1 time(s). Last edit at 06/22/2015 12:44PM by Devil Inc. So I'm thinking about purchasing the E3D-V6 Lite for this now, but I have one major concern. 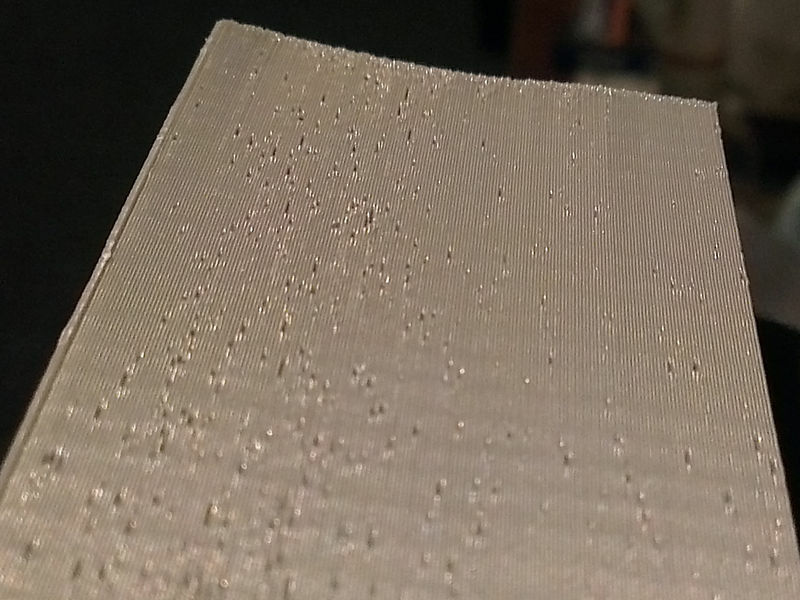 Most of my prints have more zig-zag lines on them, and from what I've found online is that's usually due to material contamination (kind of like this: [reprap.org] ) . While I have tried methods to fix this I don't think it is the problem. This also happens with brand new filament. I have been told to increase the print temperature to get rid of this though. So I have done this.. and have had relatively good success with it by doing this. Now I am printing at roughly 245-255c for ABS. That's higher than what the E3D-V6 Lite is rated for (245). So would the E3D-V6 Lite reduce this issue so I could lower the temperatures back to what is recommended?